The Virtual Caribbean Library is a portal site that seeks to provide digital access to the disparate archival and contemporary collections of the Caribbean for researchers, students, and the general public. The Virtual Caribbean, hosted at Georgia Gwinnett College, design also provides a digital interface through which students and faculty collaborate to develop digital literacy tools and web content for a network of users. The Voyages project began in 2003 as part of the South Atlantic Humanities Caribbean Digital Library initiative at the High Performance Computing Facility at the University of Puerto Rico (Rio Piedras) and initially collaborated with the University of Virginia and the Institute for Advanced Technology in the Humanties. Currently, it resides at the University of Puerto Rico. From the urban blight of Dublin’s streets, to the tropical beauty of Caribbean rain forests, and the horrors of island poverty, the stories of Irish peoples and their migrations from Ireland to the British West Indies represent a complicated socio-political period in English and Caribbean history. Ostracized, oppressed, and subjugated in Ireland, the fate of many Irish émigrés remains unknown and unmarked. 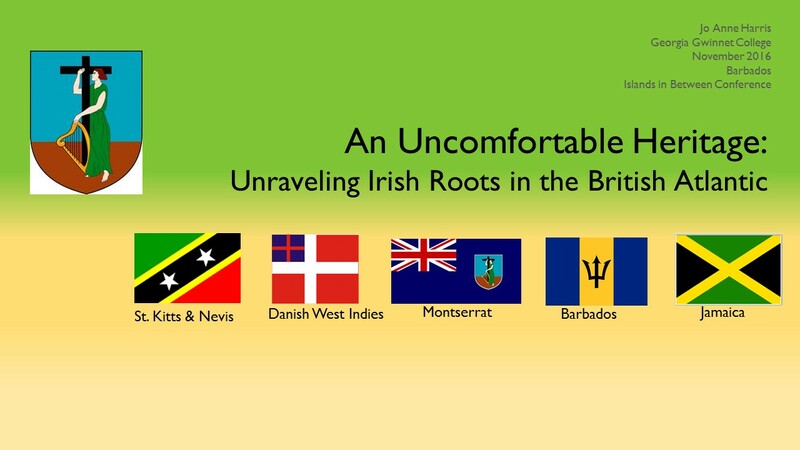 Thus, Caribbean history has relegated Irish emigrations as footnotes in the larger scheme of island colonization.